Fibersource® HN is high-protein, standard nutritional support with fiber. It contains 1.2 calories per milliliter and 62 grams of protein in a complete feeding. 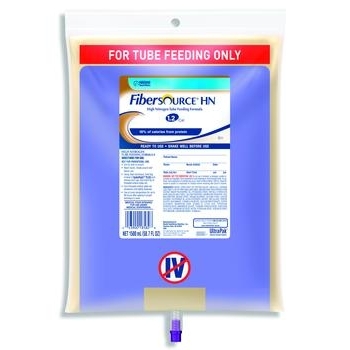 Fibersource® HN is high-protein, standard nutritional support with fiber. It contains 1.2 calories per milliliter and 62 grams of protein in a complete feeding. Protected by NutriShield®, a proprietary combination of microbial inhibitors protecting from harmful bacteria. Closed System Containers. Lactose-free, Gluten-free, Kosher. Not for individuals with galactosemia.